Maintaining your water boiler is necessary for dealing with the cold. At All Weather Temperature Control, Inc., we can keep your water boilers in best condition with a comprehensive preventive maintenance plan. But first, learn the ten common water boiler problems and ways to fix them through this post. Your boiler leaks water because of different issues in the internal components specifically the pressure valve or the pump seal. Leakage of the pressure valve is caused by excessive pressure. If leaks come from the pump seal, it probably has worn out and requires replacement. Call the professionals for immediate solutions. A broken diaphragm, motor valve, and malfunctioning thermostat are a few reasons why your water boiler produces no hot water. Fixing this issue is easy by replacing the damaged parts and requesting help from experts. If the pilot light keeps going out, the reason might be a broken thermocouple or deposit buildup. To reignite the light, try checking the gas supply or best, contact your gas provider. Condensate pipes are susceptible to freezing in the winter months because they are situated outside. If they have frozen up, pour hot water or put a warm cloth on the pipes to melt the ice. Then, reset the water boiler to fire up again. 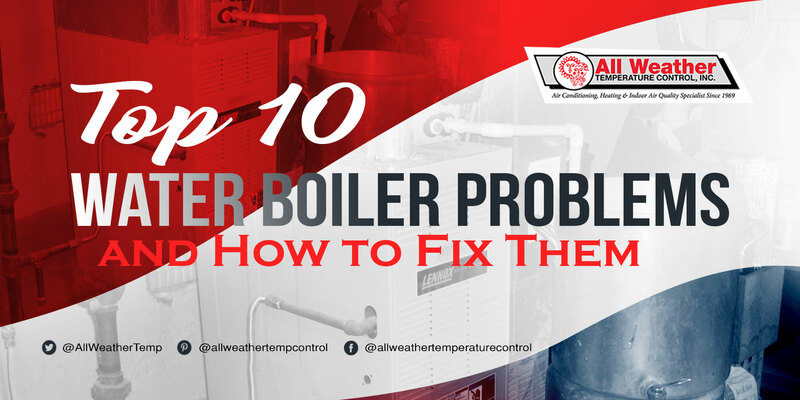 If the needle of the pressure gauge is below 1, your boiler might experience issues related to low boiler pressure. Check the system for visible leaks or malfunctioned radiators. Another solution is to replace the pressure relief valve. Don’t forget to call registered technicians for assistance. Limescale or sludge buildup causes your water boiler to produce a strange rumbling sound like a kettle does. When the flow of water in the heat exchanger is restricted, the water will overheat thus, creating the kettle-like sounds. Contact your gas supplier or a registered engineer to remove the sludge and keep the system from functioning properly. If your thermostat does not turn on/off, it’s probably time to get a new one. Prevent the thermostat from malfunctioning by placing it in the right position and keeping the correct settings. Over time, you will notice that your water boiler starts to produce strange noises like gurgling or banging sounds. With these annoying noises, it is best to call your HVAC contractor for inspection, repair or any possible solutions. When radiators are not heating up, it means that sludge has built up in the system. In this case, you have to bleed the radiators or adjust the valves. If you are not comfortable doing it yourself, you may ask for assistance from professionals. Restricted airflow and low water pressure are two potential reasons why your boiler keeps switching off. With this problem, we recommend contacting a certified gas engineer. Don’t get stuck in the cold this winter season with a broken water boiler. If anything goes wrong with your water heater, we are here to help. Call us at All Weather Temperature Control, Inc., for water boiler inspection, repair, and maintenance.